The long-awaited update allows content streaming via Netflix for subscribers with unlimited accounts. Japanese owners of a Nintendo 3DS will get access to the Video Store application today, but those of us stuck in other regions won't get that functionality until later this summer. Perhaps offered in compensation for the delay abroad - and perhaps for the increased subscription rates - Nintendo will push out the free Netflix streaming application in its update tomorrow. 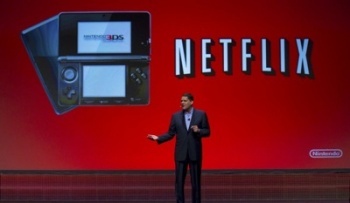 If you have an unlimited streaming sub, and a wireless connection for your 3DS, then you'll be able to watch every piece of content that Netflix offers on your tiny handheld screen in horribly ugly 2D. "This free downloadable application allows Netflix members with an unlimited streaming plan, a Nintendo 3DS system and a broadband Internet connection to instantly watch TV shows and movies on their Nintendo 3DS," says Nintendo's website showing the details of the update. You'll also have access to a few new downloadable titles from Nintendo's eShop: Baseball, Puzzle Fever, Just SING! 80s Collection, 3D Pixel Racing, AfterZoom, Game & Watch Gallery and the title that I'm looking forward to the most, Extreme Hangman 2! Finally! While I could see the Netflix application having limited use in your home, it will be awesome to watch a show here or there while traveling or sipping an espresso at your local coffee shop - provided you can pilfer some free wireless internet. If the shop doesn't offer it for free, you can always hack into the local Starbucks network. Hint: the password is "Spicy!!"